Following Donald Trump’s repudiation of the Iran sanctions deal and threats of war and the economic protests that brought thousands of people out to the streets against the country’s government, the Islamic Republic is now increasing its repression in the predominantly Kurdish Northwest. LeftEast’s interview with Dr. Kamran Matin of the Department of International Relations at the University of Sussex begins with the Kurdish question, but touches on the relationship between all three phenomena from a leftist perspective. LE: Can you give us a timeline of the general strike in Iranian Kurdistan following the executions of Ramin Hossein Panahi, Zanyar Moradi and Loghman Moradi on September 8? On August 25th, 2018, four Kurdish environmental activists were killed under suspicious circumstances while trying to put down a fire in the woods near Mariwan. Many people accused the Islamic Revolution Guards Corps (IRGC) of killing them deliberately by shelling the area. On September 7th, Iranian forces ambushed and killed 4 members of KODAR (the Free and Democratic Society of Eastern Kurdistan) near the city of Sna in Iranian Kurdistan. The next day the Islamic regime executed three Kurdish political prisoners and fired several missiles at the headquarters of the Kurdistan Democratic Party of Iran (KDP) in Iraqi Kurdistan, while the party’s central committee was holding a plenum. Fifteen KDP members, including five members of KDP’s central committee, were killed. Other missiles killed two members of another Kurdish group active in Iran, the Kurdistan Democratic Party of Iran (PDK-I), in the nearby area. Scores of people, including civilians, were injured. Following these events, the main political parties of Iranian Kurdistan (Rojhelat) called on Kurdish people in Rojhelat to hold a general strike on September 12th to protest the Iranian regime’s atrocities. People responded positively overwhelmingly and on September 12th all shops and retailers across Iranian Kurdistan remained closed. LE: How do these events—both the execution of these Kurdish activists and the general strike in response—relate to Kurdish struggles elsewhere in the region? To the extent that the strike was part of the century-long struggle of Iranian Kurds for the recognition of their collective identity and political and cultural rights, it is part and parcel of the wider Kurdish freedom movement across the Middle East. The strike was also a remarkable experience of a peaceful method of struggle under extremely harsh and repressive circumstances. In this regard the people of Rojhelat once again demonstrated their political maturity and initiative in using a method of political struggle that is impactful with minimal human cost, setting another successful example for the wider Kurdish movement in the region. The strike also precipitated a relatively rare moment of unity within Kurdish political organizations, which remain deeply divided, unable to agree over an effective alliance or a structured cooperation at a time when the Iranian regime is beset with one of its deepest crises since the late 1980s. LE: Ramin Hossein Panahi was sentenced to death for the crime of muharebe, often translated as “enmity to God.” What does this tell us about the interweaving of Islamist motifs with the unitary nationalism that the Islamic Republic inherited from the Shah? Soon after its foundation and especially during the Iran-Iraq war, the Islamic Republic moderated its pan-Islamist rhetoric and symmetrically re-incorporated key elements of the ideology of Iranian nationalism, especially its Shi’a-Persian supremacist aspects. This trend reached its apogee following the violent suppression of the protest movement that emerged after the rigged 2009 presidential elections. Facing a deep crisis of legitimacy, the regime systematically cultivated Iranian chauvinism. This was also useful for the regime to justify its regional interventions, especially its strategic support for the Assad regime, whose bloody suppression of the Arab Spring protests turned the Syrian revolution into one of the most catastrophic civil wars in the world. In this sense, while the regime’s suppression of dissent is formally wrapped in the Shari’a law terminology, substantively, it is driven by a particular ideological mix in which Iranian nationalism increasingly dominates the explicitly Shi’a-Islamic elements. LE: How does this strike relate to the nationwide wave of labor unrest in October 2018, in which truck drivers and oil, chemical and railroad workers have gone on strike? These nationwide strikes have, by and large, occurred after the general strike in Kurdistan. Given the repressive political circumstances, it is difficult to assess to what extent the political strike in Kurdistan inspired the subsequent labor strikes in the rest of the country. However, given the widespread use of social media in Iran, it is plausible to assume that the strike in Kurdistan has played a role in igniting the subsequent strike, performing the role of a popular vanguard. It should be noted that the Kurdish labor movement is very active and that Kurdish laborers in Iranian Kurdistan form one of the most organized and politically conscious and active branches of the working class in Iran. Kurdish workers have used May Day celebrations to express their demands for social justice every year. Kurdish workers initiated and continue to play a key role in the Coordinating Council for the Formation of Labor Unions in Iran, which is a broad umbrella front to unionize workers and organize them for trade-union rights. LE: From what we gather, Iranian capitalism has a peculiar structure, in which concerns tied to military and paramilitary forces control much capital. What implications does this structure have for workers seeking to build nationwide and cross-sector ties? More than the para-statist character of Iranian capitalism, it is the oil-rentier nature of the political economy that constrains – but also empowers – the labor movement in Iran. The concentrated nature of the oil industry means that much of the capital in Iran is ultimately politically controlled and distributed by the state, which itself has an increasingly semi-oligarchic character. Outside the oil industry, Iran lacks large factories or industrial plants employing more than a few hundred workers. The fragmentation that results from this circumstance is intensified by the regime’s political suppression of all forms of non-state organizations, political or economic. However, in a rentier state, the distinction between the political and the economic is very blurred, which is why almost any action that begins with a specifically economic issue quickly turns into a political intervention. And the regime views all protests as political and treats them accordingly. Having said that, the oil rentier nature of Iran’s political economy also means that oil works have a potential power and efficacy disproportionate to their numerical size. The oil workers’ role in the concluding months of the 1979 revolution demonstrates this circumstance, which is why the Iranian regime has worked hard to control and pacify oil workers through a variety of means. LE: Trying to grasp who is or leads the Left in Iran today is difficult, since decades of repression have driven so many leading activists and intellectuals underground or into prison or exile. Are there groups or networks active in Iran that we should be following? The Communist Party of Iran (CPI) (not to be confused with the defunct, Stalinist Tudeh Party), through its Kurdistan organization (Komala-CPI), has played and continues to play an important role in organizing workers and offering support and leadership. Most other left organizations remain disconnected from the Iranian political scene due to their organizational destruction at the hands of the regime and internal, never-ending ideological disputes. To the extent that many on the Iranian left never moved beyond their ‘third-worldist’ anti-imperialist nationalism of the last century, they have had difficulty in forming a clear political strategy against a regime that formally is in a perpetual conflict with US. In this regard too, the radical Kurdish left in Iranian Kurdistan offers a remarkable case of a Marxist left movement that has never imprisoned itself within the false dichotomy of imperialism vs. anti-imperialism and from day one resolutely opposed the semi-fascism of the Islamic Republic without blunting its anti-imperialist politics. LE: The current wave of labor unrest in Iran has come at a time of acute crisis for the vast majority of Iranians. Whom do the popular classes blame for the crisis? As I mentioned above, because of the rentier nature of Iran’s political economy most Iranians see the state as directly responsible for their material and economic circumstances. This view has been reinforced by widespread knowledge of countless cases of corruption at the highest levels of the state, often involving the children of very senior officials. The term ‘aghazadeh-ha’ (lords’ children) in Iranian political discourse today refers to this systemic and systematic corruption within the state. However, the absence of a strong, nationwide democratic-left movement in Iran today prevents the political consummation of the deep social discontent that exists among the Iranian masses. And the regime pursues a systematic policy of fear-mongering, frightening people of the ‘Syrianization’ of Iran should the Islamic Republic be weakened or challenged. The bitter irony is that the Islamic Republic has played a key role in the catastrophe that has fallen on the Syrian peoples. LE: Are there clear demographic and class tendencies separating those angry with President Rouhani or the regime from those more inclined to blame the US first and foremost, given Trump’s withdrawal from the nuclear agreement and his pursuit of what Rouhani calls “economic terrorism”? Based on my admittedly limited monitoring of Iranian media outlets, a growing number of people blame the government for the current crisis. One of the slogans in the street protests last winter was ‘leave Syria, take care of us!’ In other words, people think that the government has money and resources to invest massively in Syria and elsewhere in the region, but fails to remedy the abject poverty in which a growing majority of Iranians are finding themselves. LE: How should leftists abroad approach the Islamic Republic at this moment? What can we do to show meaningful solidarity with the working class and oppressed minorities as they struggle with a state that can credibly claim, perhaps now more than ever, to be in the crosshairs of US imperialism? The international left must explicitly support the working classes and oppressed minorities in Iran and at the same time oppose direct foreign intervention in Iran. 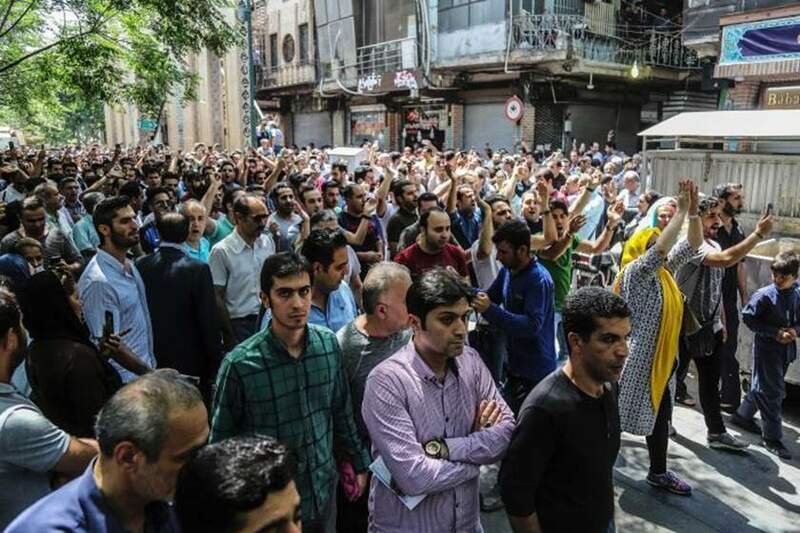 It has to engage the left-democratic opposition and pressure the Iranian regime to address the basic grievances of Iranian workers and toilers, the most important of which is the need for free, non-state-dominated unions and organizations. The failure of the international left to express explicit and effective solidarity with Iranian workers and minorities for fear of indirectly and unwittingly helping the apparent regime-change agenda of the US will only hasten the attraction of more people to the idea of external regime change, as they will see no possibility for successful domestic resistance against the regime. Just as the Iranian left needs to think and act beyond a purely anti-imperialist project, the international left too needs to recognize that the Islamic Republic’s hostility towards the US and West more generally does not exonerate it from the horrendous crimes that it has committed against the Iranian people and the incredibly violent, repressive neoliberalization that it has imposed on the Iranian masses, or the semi-colonial violence that it is waging on minoritized peoples inside Iran. If Iranian workers and people feel that they are supported by left and democratic forces in the West, they will be empowered to develop their own organic organizations and leaderships in the course of their own collective struggle for radical democracy and social justice, which is the most effective way of blunting the efficacy of imperialist meddling. Kamran Matin is a senior lecturer of international development at the University of Sussex. 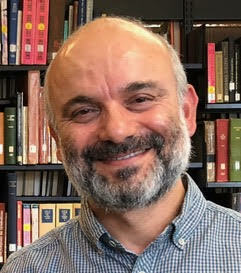 He specializes in Marxism, political Islam, Iranian and Kurdish studies, Middle Eastern and African history and historical sociology.